Richland County Ambulance Service is currently seeking qualified candidates for open Part-Time Advanced EMT positions. The Service has been providing coverage with blended crews since 2015, successfully blending the consistency in scheduling through full-time/part-time with the neighborly care and compassion of volunteer/paid-on-call staffing. Located in the beautiful “Driftless area” of Southwest Wisconsin, Richland County Ambulance Service is an Advanced level service providing 911 response as well as inter-facility transport. Applicants must be 21 years old, have a valid Wisconsin driver’s license and a current Wisconsin AEMT license or higher. Candidates considered for employment must pass a criminal background check and drug screen. Qualified applicants will be asked to participate in a series of written and psychomotor skills testing related to the position prior to being offered employment. 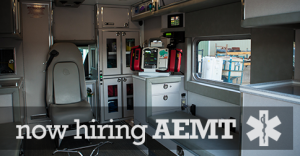 Richland County Ambulance Service offers competitive pay, uniform allowance, benefits package for eligible positions, flexible scheduling, progressive protocols and continuous inhouse and web-based training for all staff. The starting part-time wage is $12.73 per hour with an increase after the probation period has been completed. Richland County is an equal opportunity employer. Completed applications must be accompanied with a resume and cover letter and returned to the Richland County Ambulance Office, located on the first floor of the Richland County Courthouse 181 W Seminary Street, PO Box 251, Richland Center WI 53581. Applications will continue to be accepted until all positions are filled. Download an Application or Contact us. I’ve learned that I don’t do well with routine. I couldn’t spend my work life in a cubicle. I’d rather chew tinfoil than show up each day and do the same thing. EMS is infinitely variable. Just when you think you’ve seen it all someone will pick up the phone, dial 911 and prove you wrong. Unlike so many jobs and careers, medicine is profoundly human. We interact with people and see the full spectrum of the human condition. Few people clean the house or put on their Sunday best before they dial 911. We see a very real slice of humanity in EMS. Being a patient is a, “come as you are.” experience. I mean, it’s everywhere. You can go anywhere on the planet and practice medicine. The opportunities are truly endless. I practice EMS in a major urban center but I’ve also practiced it in the middle of the Mojave Desert. Early next year I’ll go out into the jungles of northern Panama and practice EMS there too. I mean really, it’s huge. You will never master emergency medicine. The vast well of knowledge that is medicine grows far faster than you can learn and absorb it. You can dedicate a lifetime to the understanding of this one small facet of medicine and you’ll still only scratch the surface. The people are fun and the work is fun. This can actually take some folks a long time to learn. We get so caught up in the seriousness of EMS that we don’t really enjoy the process of running calls together. One of the benefits to sticking with the job long enough to achieve a level of comfortable competence is that you can really start to relax and have fun. Two weeks ago, I spent two full days riding a bike around a senior PGA tour event. I was on the medical response team. Last week I was backstage at the Iron Maiden concert. I was on fire watch duty. After 20 years in EMS the job is still filled with first time experiences. I’ve lost count of the seemingly endless parade of lifetime firsts that I’ve logged on the job. People always had medical emergencies and people will always have medical emergencies. When they do, they’re going to want someone like you around. That’s kinda nice when you think about it. I don’t get people who don’t feel fulfilled in this line of work. Well, OK, maybe I do get them. So let me clarify. 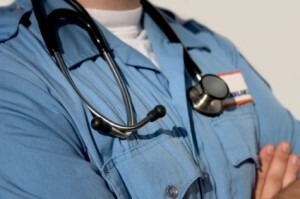 If you do your job to gratify yourself and your ego, EMS isn’t very fulfilling. If you do your job to be of service to others, EMS is very fulfilling. Sure most everyone’s job matters. But some folks have to reach farther than others to explain how their job matters to others and to their community. In EMS it reaches out and smacks you in the face. To every single person who calls for your service you matter. The job you do, the service you provide and how well you provide it all matter. This job gives us a unique and privileged perspective on the human condition. One that is hard for people in other lines of work to understand. You just can’t do CPR on someone’s husband and then go home and be angry about the coffee stain on your rug. You can’t take someone’s child to the emergency room for a rare respiratory condition and then go home and yell at your kid for not cleaning his room. EMS gives us an amazing perspective on what’s really important in life. It’s a perspective that few people have. It’s a perspective that’s reserved for those who experience great tragedy and those who help. We get the perspective without the grief. It’s a gift. It’s a gift than many EMS caregivers leave unopened.